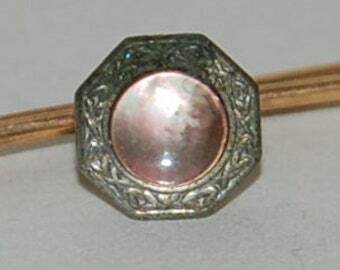 1930s-'50s era Set of Three Smokey Mother of Pearl Shirt Studs -- Free US Shipping! 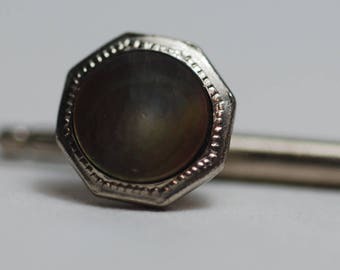 This is a set of three smokey mother of pearl shirt studs in a square cabochon style set into fancy gold filled mounts, all working well with no repairs or restoration. There is no maker's mark evident. There are some scratches and surface marks consistent with age and use, but nothing detrimental. 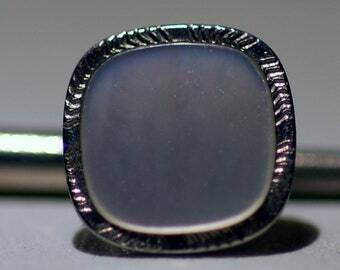 1930s-'50s era Set of Three Smokey Mother of Pearl Shirt Studs by Krementz -- Free US Shipping! 1930s-'50s era Set of Three Mother of Pearl Shirt Studs by Swank -- Free US Shipping! 1930s Era Formal Smokey Mother of Pearl Pinwheel Pattern Tuxedo Studs and Links Set -- Free US Shipping! 1940s-'50s era Formal Diamond Tuxedo Studs and Links Set -- Free US Shipping! 1950s Era Formal Smokey Abalone Tuxedo Studs and Links Set -- Free US Shipping! 1950s era Krementz Stag Tuxedo Shirt Studs and Cufflinks Set -- Free US Shipping! 1950s Era Formal Tuxedo Studs and Links Set in black by Swank-- Free USA Shipping! 1930s Era Larter Formal Tuxedo Studs and Links Set -- Free US Shipping! 1940s -'50s era Smokey Mother of Pearl/Abalone Formal Tuxedo Shirt Studs Set of Three -- Free USA Shipping! 1960s-'70s era Formal Tuxedo Shirt Studs and Cuff Links Set by Woolno. -- Free USA Shipping! 1950s Era Correct Brand Formal 10K Gold Tuxedo Studs and Links Set -- Free US Shipping! 14K gold Formal Tuxedo Studs and Vest Buttons-- Free US Shipping! 1950s-'60s era Swank Formal Tuxedo Dress Shirt Studs and Cufflinks Set -- Free USA Shipping!